A new spot to score poke and more has made its debut in the neighborhood. Located at 38 W. 38th St. (between 5th Ave. & Avenue Of The Americas) in Midtown, the fresh addition is called Poke Junke. This new spot comes from executive chef Juan Saurez de Lezo--who originally hails from Spain--and specializes in fusion-style poke bowls inspired by the diversity of New York's food landscape. 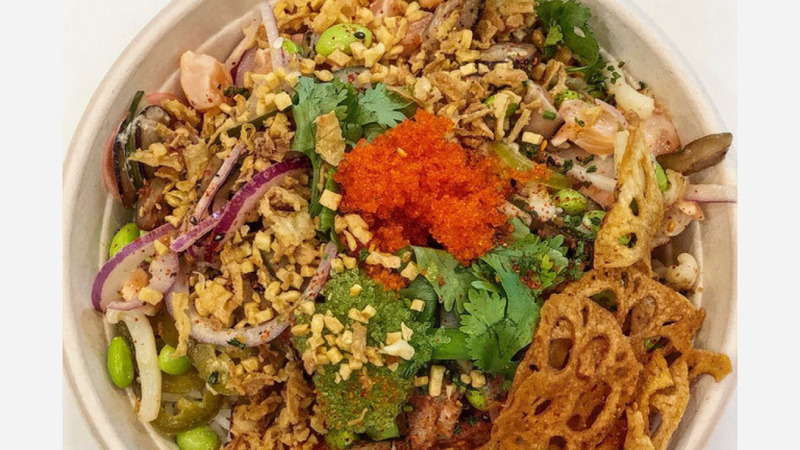 Similar to most poke eateries, the menu features a build-your-own bowl concept where diners first start by choosing a base like coconut or brown rice, kale or Brussels sprouts and quinoa. You can then choose a protein like ahi tuna, salmon or organic tofu; mix in veggies like edamame, sweet onions or jalapeno; and top it off with extras like pickled radish, bonito flakes or roasted pineapple. You can then select a sauce flavor profile and add crispy bits of garlic, shredded nori or lotus. With a 4.5-star rating out of 10 reviews on Yelp so far, Poke Junke seems to be a welcome addition to the neighborhood. Yelper Jean P. said: "Most poke places I've been to in this area have been small, so upon entering, I appreciated the larger space. You have the option of dining in at least (and not wait outside in a line to get in)." And Diana C. said: "Solid poke. We got the signature bowls ahi tuna and tropical ceviche. Good amount of fish in each bowl. Ingredients seem fresh. Tasty. Price was OK. Would return."